Applications for 2019/2020 will be processed as they become complete and you will be notified as to whether or not your child is offered enrollment or offered a place in the "wait pool." Because our classes are currently full, we are unable to make firm offers in most instances until we know of families who will be leaving at the end of the school year. Children whose complete application package has been reviewed and are “eligible for admission” but with no space in the grade or the program needed, may, at parent’s request, be put in the Wait Pool. It is impossible to predict when or if a place will become available. 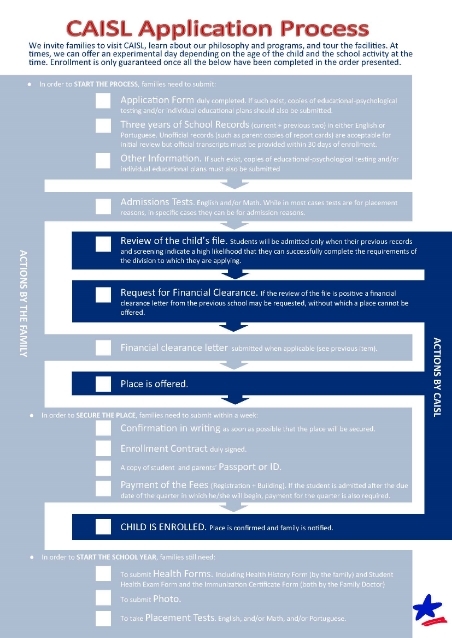 When space becomes available in a particular grade and/or program, the applications of every child in the Wait Pool are reconsidered and offers are made based on the academic/behavioral records submitted. Students whose parents are US Government employees. Students who are coming from American or American International Schools. Students who are coming from schools whose primary language of instruction is English. Students who are linguistically unable to attend a school whose instructional language is Portuguese. Students who are linguistically able to attend a school whose instructional language is Portuguese. Provide the most recent three years of school records (if applicable due to age).--records from the current school year and the previous two years. These can be sent to our offices directly. Other Information - If such exist, copies of current or most recent educational-psychological testing and/or individual educational plans must also be submitted. * If a paper format is more convenient for you, you may download it here. As an international school, CAISL has students entering and leaving at all points during the school year. Therefore, we have “rolling admissions” which means that students can be accepted and can enter at any point in the school year. Ideally, for ease of academic and social transition, entry at the beginning of an academic “quarter” or the “semester” is ideal but not required. Decisions on whether or not to admit a child are made by a team consisting of a member of the Admissions Team, the Elementary or Secondary Principal (as appropriate), and the Director. Other specialists (Learning Support/Special Needs, English for Speakers of Other Languages, International Baccalaureate Coordinator, School Nurse, for example) are part of the decision as needed. Communication about applications and the decisions are via the Admissions Team. School Academic and Behavior Reports: CAISL needs the most recent 3 years of school reports. These should show both the academic results of classes taken but also the comments from teachers/tutors. If the academic record is a “transcript” and does not show teacher comments, then please provide copies of report cards as well. Standardized Tests (if any): If the child took standardized tests such as MAP or Iowa (USA) or SATS or (I)GCSE (UK), please provide these also. Letters of Recommendation from the current teacher/school: While not required, these are often quite helpful. Educational/Psychological Testing: If applicable, this must be sent along with any IEPs/504s. Be aware that CAISL’s Learning Support/Special Needs program is designed to support those with mild learning difficulties and CAISL can only admit students who are able to be successful, with only moderate levels of support, in our program. Medical Report (if applicable): For a child with medical conditions requiring the attention of the school nurse, a medical report may be required. Applicants for High School (9th through 12th Grades) who are not native speakers of English or whose records do not give proof that English would be at a high enough level for a High School Program. Students whose records indicate difficulties with Math. Students who wish to enter the Portuguese Native Language Program but are not coming from a school whose language of instruction is Portuguese or whose records indicate difficulties with Portuguese. Class Size: Most of CAISL’s classes are currently full although, as an international school, there are at times unexpected departures during the school year. To increase the possibility of securing a place, apply as early as possible. Once a class “closes,” it accepts no new enrollment until a student leaves. Program Size: In addition to the number of students in a grade (often called “class size), students at times need the services of other programs such as Learning Support/Special Needs, English for Speakers of Other Languages (ESL), Nursing/Medical care, or the International Baccalaureate Diploma Program (IBDP). At times, there may be space in a grade but no space in these specialized programs and, thus, the application will be denied. For students who are not native speakers of English and who wish admission into CAISL´s High School, please refer to our guidelines here.